Velveting is a cooking technique used to protect proteins by way of marinating and coating delicate proteins, preventing drying and toughening and producing soft, "velvety" mouth feel well suited to many Napa Valley Chardonnays. Top and tail the peas and reserve. Bring a large pot of water to a boil with a dash of salt and cook the peas rapidly for about 1 minute. Drain into a colander and spray with cold water to stop the cooking. Dry well and place in refrigerator. This step can be done in advance. Let the peas come to room temperature before cooking. Velvet the shrimp. If done in advance, do not refrigerate. Mix together sauce ingredients in a small bowl. Stir well just before using. Heat a wok or large, heavy skillet over high heat until hot; add the 3 tablespoons of oil, swirl and heat for 30 seconds. Lower the heat, toss in ginger and garlic and press ginger and garlic into hot oil a few times. Turn the heat to high, scatter in the velveted shrimp, and toss briefly for about 30 seconds. Sprinkle in the salt and sherry, add the stock and stir a few times. Add the snow peas, stir to mingle well and just long enough to heat through, and then add the sauce ingredients. Stir in fast and turning motions until the liquid has evaporated. Pour over jasmine rice on a platter, squeeze lemon wedge over the dish and serve immediately. 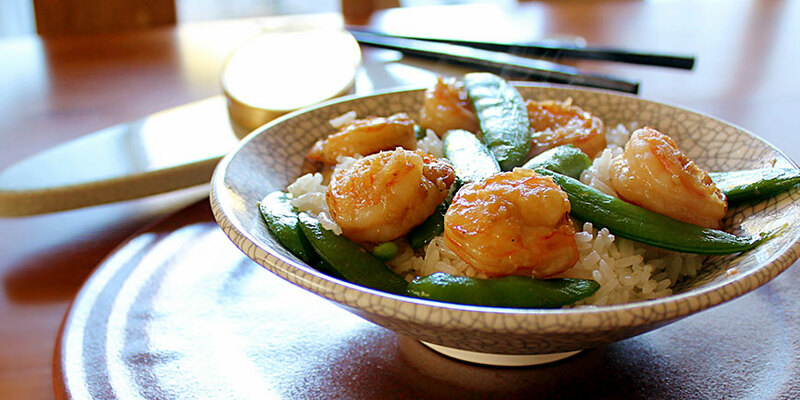 Place the shrimp in a large bowl; sprinkle with the salt and sherry and gently mix well. Beat the egg white just until the gel is broken and add to shrimp. Sprinkle in the cornstarch and mix until smooth. Add the oil and stir well. Place the shrimp in the refrigerator for 30 minutes, so that the coating adheres to the shrimp. Heat a wok or large, deep skillet over high heat until very hot. Add the the 1 cup of oil and heat over medium heat until the oil is hot but not warm, about 275 degrees F (on a deep fat fryer thermometer) or until oil foams a cube of bread very slowly. Scatter in the shrimp and stir gently in a rocking motion so that they separate and are coated all over with oil. The moment they turn white with a pinkish undertone, pour oil and shrimp into a strainer over a pot and let the shrimp drain; then put on a plate lined with paper towels. The shrimp are now ready to be stir-fried. 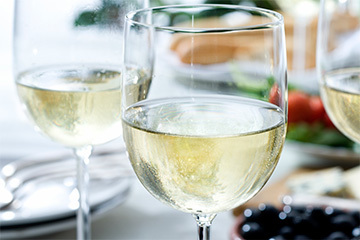 A Chardonnay with a touch of acidity and a bit of oak will bring out the texture of the velveted shrimp and the flavors of the sauce.